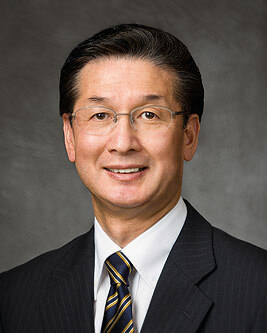 Kazuhiko Yamashita is a General Authority in The Church of Jesus Christ of Latter-day Saints. He was sustained as a member of the First Quorum of the Seventy on April 2, 2011. He was born in September 1953, in Sumida, Japan, and grew up in Tokyo. He was baptized in 1971 after he was introduced to the gospel through the missionaries’ presentation at the World’s Fair, Expo 70 held in Osaka. He earned his bachelor’s degree in education from Saitama University and his master’s degree in sport science from Tsukuba University. For a time he studied the philosophy of physical education at Brigham Young University. During his career he was an instructor and professor at various universities including professor of health and sport sciences at Fukuoka University and a visiting professor at BYU. He and his wife, Tazuko, are the parents of six children. He previously served as a bishop, high councilor, stake president, stake mission president, and Area Seventy.